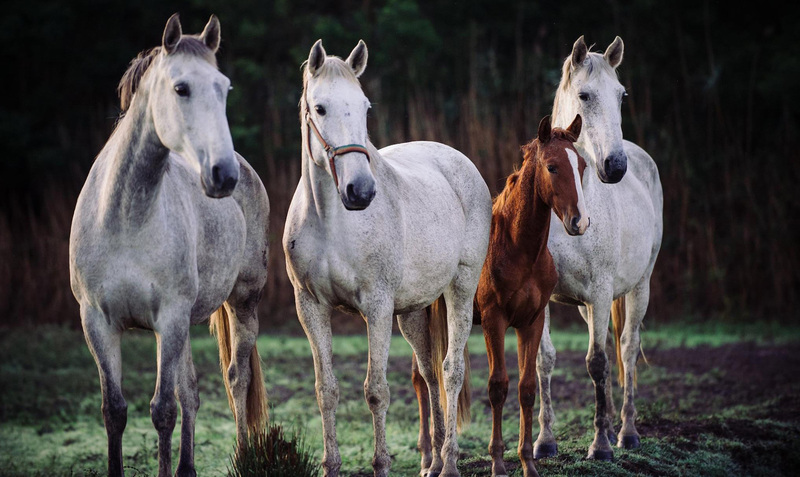 The aim of this second (Part One) article is to help you establish in an easy and practical way a healthy feeding regime for your Lusitano horse. This advice is being provided for an average 500kg healthy horse in regular work (1h per day). If your horse is in high level competition or if it’s a broodmare or a foal, you should first talk with your Vet to plan a specific regime for their requirements. There are two basic aspects to your feeding regime: Water and forage. A horse deprived of feed, but supplied drinking water, is capable of surviving 20 to 25 days. A horse deprived of water may only live up to 3 or 6 days. Water should be good quality and readily available. Extreme water temperatures both hot and cold reduce the intake. On average a horse will drink between 20 and 40 litres of fresh water per day, but keep in mind that the food consumed, climate and daily work can influence the amount of water required. If you are not certain the water available for your horse is good quality, a simple chemical and microbiological analysis will be sufficient. If you have any doubts, consult your Vet. An important question is what Kind of forage do I have available for my Lusitano? Is it straw? Is it ryegrass hay? Is it silage or fresh grass? The answer to this question is the keystone to your feeding regime. As you know horses are herbivores and so, forage is the base of their diet and should represent at least 60% of their daily food intake. Because forages are not all the same when it comes to their nutrient constitution, we should know in advance which are available to us at what time of year. Do I need concentrate for my horse? Most probably yes. Because your horse is not just out in the field grazing we will have to account for his extra needs. Which brands are easily accessible to me? You should avoid brands that you can’t guarantee a regular supply. This helps prevent interruptions and sudden changes which is not good for you horse’s health. Choose a good brand: Good not always means expensive. If you are not familiar with any brands, ask your friends or local riding centres for their personal experiences. Nowadays all brands have different levels of proteins, fats, carbohydrates, minerals etc developed according to the discipline or workload you intend for your horse. Step 4: Which horse feed should I buy for my horse? Nowadays there is no easy answer. There are however a few hints you may follow to help you out. You should look for the maintenance ones. Because Lusitanos are adapted to low energy intake for their needs, it is better to avoid the ones with a high content of starch. We have already seen on previous articles that this breed is prone to obesity… This is a common mistake that you definitely want to avoid. If your enjoy having your horse with a little more stamina, look for an average amount of starch content. If you prefer to keep your horse calm during work but still keeping is willing to go, you should look for a reference with a higher content of fat. Talk to your distributor they can help you to select the ones that better suit your horse. Table 3 shows you three examples of concentrates according to the energy level and fat/starch ratio. On a quick look you’ll immediately see that main difference between fast and slow energy release concentrates. First option grabs the energy mainly from starch, does inducing a more “nervous” behaviour on your horse. Option three has an even higher digestible energy content but with a much lower starch content creating a less anxious behaviour but with a lot of endurance. In this breed, a maintenance feed will suffice for most rider’s requirements. Using the example from table three the amount of concentrate for our Lusitano in moderate work should be 3 Kg/day of maintenance example or 2.5 Kg/day of slow energy release type (based on an average of 10 kg daily ingestion of 8% crude protein forage). Step 5: Are concentrates the only option for my horse needs? The answer is no. We have now available all different types of energy and protein sources. On the protein side you can use Alfalfa. Good alfalfa can be 18-20% protein with a high energy content; is also very high in calcium (5 to 1 Ca/P ratio).It’s an excellent complement for your forage when you are using straw. On the other hand it should be used with great care while using high protein content forages such as haylage. Because of this, it should be used wisely and always taking in account forage and concentrate being used. On the energy side you’ll find Beet pulp. It’s the fibrous material left over after the sugar is extracted from sugar beets. It’s an excellent source of digestible fibre, with a relatively low crude protein content (averaging 8 to 9%), comparable to good-quality grass hay. Its digestible energy is somewhere between that of hay and grain making it an excellent source of slow release energy. Its chief value is as a soft, highly digestible fibre source making it just right if the quality of your hay is poor, or if you have a geriatric horse who has trouble chewing. Beet pulp’s excellent digestibility also makes it a great choice for a convalescing horse. Step 6: What are the advantages of combining different energy and protein sources? Forages pass the intestine and are digested through fermentation in the hind gut. Concentrates are digested in the horse’s stomach and small intestine. If the concentrate content is too high it will lower to much the ph in the stomach making horse’s prone to Gastric Ulceration; if it reaches the hind gut, the pH in the cecum will become more acidic, killing the bacteria essential for the normal digestion, and potentially causing colic or laminitis. Concentrates should be less than 40% of the diet with a 20 to 30 % concentrate level being more desirable. How can we achieve this and still meet our horse’s demands? Let’s take the example of Alfafa; because of what we discussed previously, most times it will allow you to decrease the amount of grain used by 15 to 20%, increasing the fibre content of your diet. Step 7: Which fat sources may I use? Fat has a number of benefits for the working Lusitano. Not only is 85 percent digestible, it is an easy way to increase calories without increasing volume; not to mention fat helps produce glossy coats! Don’t forget that you should only use raw oils for you horse. One of the most balanced options is the Soybean oil. It contains the good, unsaturated fats, the Omega 3, and vitamin E. These omega-3 essential fatty acids, or EFAs, balance out the omega-6 EFAs your horse gets from other food sources like grain. Too much omega-6 can lead to inflammation, so a healthy balance is important. Vitamin E is an antioxidant that among other things protects the muscles and your horse’s immune system. Corn oil is another vegetable oil but it has a much higher ratio of omega-6 to omega-3 EFAs, so even though horses seem to prefer the taste, this imbalance makes it a second choice. There is however some evidence that it helps reducing the effects of low pH in stomach mucosa. Fish oil may not be as appealing to your horse, and it is not an economical method of adding fat, but it is high in Omega-3 EFAs. The average amount of oil per day is 100ml divided by the concentrate meals; going as high as 300ml. Introduction should be progressively with 20ml increments. Step 8: How many meals per day? When feeding a diet that consists of both forage and concentrate, hay should be fed first followed by the concentrate. Feeding in this manner will assist in the slow passage of the concentrate portion of the diet allowing for proper digestion in the small intestine and also avoiding sudden drops in stomach pH. The amount of concentrate meals per day actually depends on the amount of concentrate being feed. Horses should not be offered >0.5% of their body weight in concentrate (2.5Kg for an 500Kg horse), in a single feeding. It reduces digestive efficiency and predisposes to problems such as gastric ulcers, insulin resistance, laminitis, and colic. If large amounts of concentrates are being fed (>2.0Kg/day), the total amount offered daily should be divided into two or more feedings never surpassing 1.5Kg/meal. João Crespo is one of Portugal’s top FEI approved veterinarians that has over 19 years of experience. He has worked with well known veterinarians throughout the world such as Jeffrey Lane in England, Phillipe Benoit in France and Alan Ruggles in USA. João is highly appreciated for his professionalism and enthusiasm in his everyday work and takes holistic approach in his treatments. João has also a degree in chiropractic medicine and at his clinic, outside Porto, Crespovet team provides a wide range of services. You find their website here.